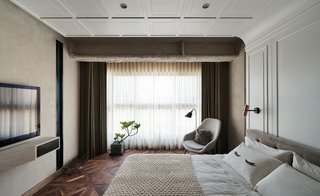 One family's "deconstructed" flat in New Taipei City disguises unsightly steel ceiling girders and exposed pipe with eclectic surface materials. When a Taiwanese expat couple with a two-year old child returned home to Taiwan, they decided to settle down in the district of Xindian in Taiwan’s New Taipei City, where the husband had spend most of his childhood. 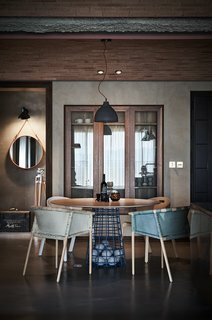 The couple purchased a 1,352-square-foot apartment near the river and reached out to Taipei–based interior design firm KC Design Studio to help them turn it into a stylish, modern home where industrial elements like steel, brick, and exposed concrete harmonize with vintage accents. 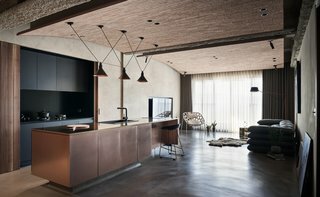 Polished concrete provides a surprising contrast to the raw surfaces of the ceiling. 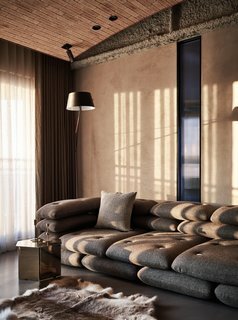 More masculine design elements and a darker color scheme express the style preferences of the husband in the main living area. 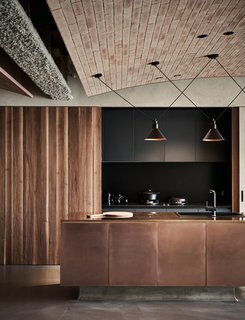 In the open kitchen, wood-paneled sliding doors conceal dark cabinetry. 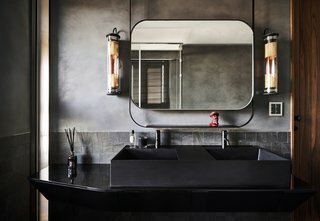 These combine with a sleek, dark counter and a shiny, bronze-clad island for a luxe effect. 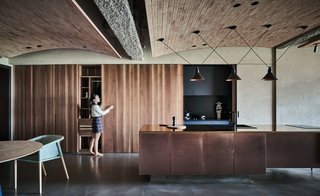 Within the open-plan living, dining, and kitchen space, KC Studip created a second ceiling in the form of three brick arcs that extend from one girder to the next, with each gentle arc rising over one of the functional zones. The open-plan kitchen flows seamlessly into the living area. The fireproofing material that the architects used to cover the steel girders give them the textural appearance of roughened concrete. The architects decided to apply the concept of deconstruction, allowing them to use the girders as "ceiling lines" that demarcate the different functional zones in the open-plan living, kitchen, and dining area. 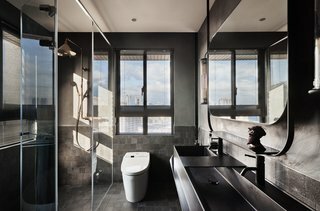 The architects designated one section for the common areas, and the other for the private areas: two bedrooms, dressing room, and bathroom. 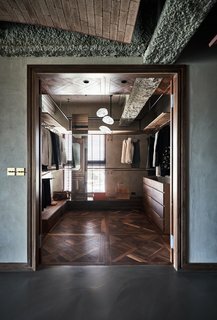 In the two bedrooms, the floors transition from polished concrete to warm parquet with interesting grains and varied shades set in a latticed pattern. 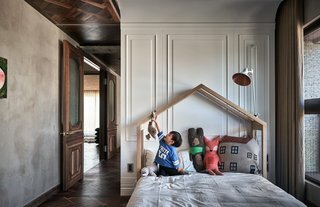 Sections of the walls and ceilings in the bedrooms were fitted with white panels that look like closet doors, hinting at a sense of being upside down. 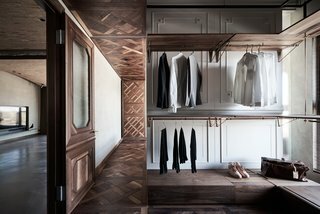 The apartment’s floor plan consists of two parallel spaces. The interiors, which have ceilings that are almost 10 feet high, included steel girders and pipes that were extremely low. These arcs create three vaulted, brick ceiling panels. The panels help increase the sense of height within the space while embracing the previously unattractive girders, making them part of the overall aesthetic. 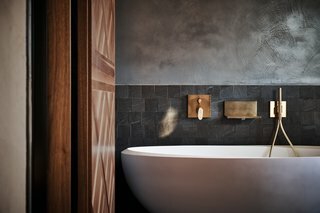 Gray plaster was used for the walls. For the private areas, lighter colors, warm wood, and more classical details cater to the wife's preferences. 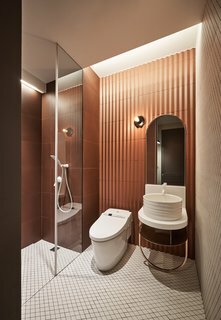 The ever-shifting material palette continues in the two bathrooms, which have walls and ceilings with different types of tiles. 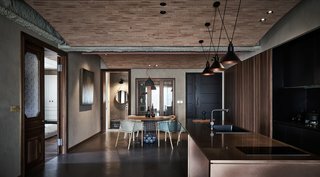 The apartment’s floor plan consists of two parallel spaces. The result is a feat of spatial deconstruction that creates visual tension and endows each space its own identity, while still allowing them to remain unified with a single design concept.